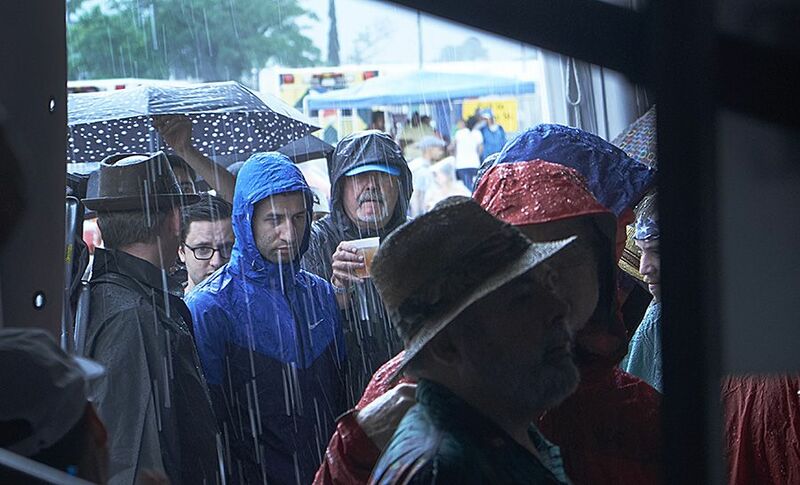 If ya enjoy music and feasting : Ya gotta get to New Orleans for Jazz Fest..
After three wonderful days at Jazz Fest we woke this morning to rain. It was a bit more than a shower, locally described to us by many as a severe storm, a tornado, and a small hurricane or typhoon. Much worse than we had on Saturday. We decided to sleep in, have a day off, relax and update the travel blog. Monday morning brunch at The Modern. 11 am and it’s very dark. After our upgrade experience, we were not looking forward to 10 hour American Airlines flight – to Dallas Fort Worth… However were pleasantly surprised as plane was half empty and plenty of space in middle rows to completely lie down! Flight also was half an hour shorter due to good weather so luck all round. Very honest signs in New Orleans. We should all take note. Arriving in US after Spain a bit of a culture shock, we had quite a wait , 3 hours, in the airport before connecting flight to NOLA so found a quiet bar to enjoy a beer and catch up on some emails…. No surprise, flight to New Orleans full but quick, checked into hotel and off for a walk towards French quarter, quick bite to eat – southern style jambalaya and beer, walk through the galleries and then back for a sleep. Next day, wandered back down to Mississippi, and then followed Dr. Bobs recommendation and tried Cafe Amelie for lunch, charming courtyard in the French quarter on Royal at, great food and ambience, stopped by musicians courtyard on Bourbon St for music and beer, Milt followed Sam’s suggestion and had a Hurricane- first and last ….pretty sweet. That night we met Dr Bob and Julie at a great uptown restaurant, right near the levy ..Brigtons. Set in a small really charming house we had a table in the window alcove, and enjoyed a bottle of Seppelt show reserve sparkling burgundy, which behaved itself even after travel, and a great Spanish wine, courtesy of Dr. Bob. Food and service was excellent – traditional Gumbo Milt had soft shell crab- in season and oh so different to anything other soft shell crab that we have had before. 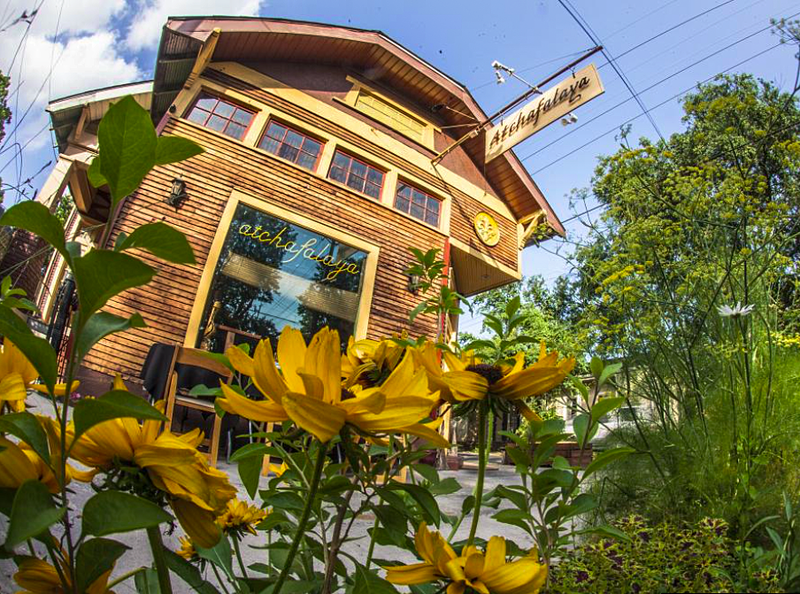 Next day, AM had a yoga fix at Aubodon yoga – again in the uptown area. So wonderful to be part of an Iyengar yoga community and know that when you find an accredited Iyengar school that it will be a great experience and this was no different, great class really friendly people and superb coffee (rare) / brunch place called Toast, for afterwards, even had sourdough bread with avocado and egg which is my usual Saturday after yoga fare! 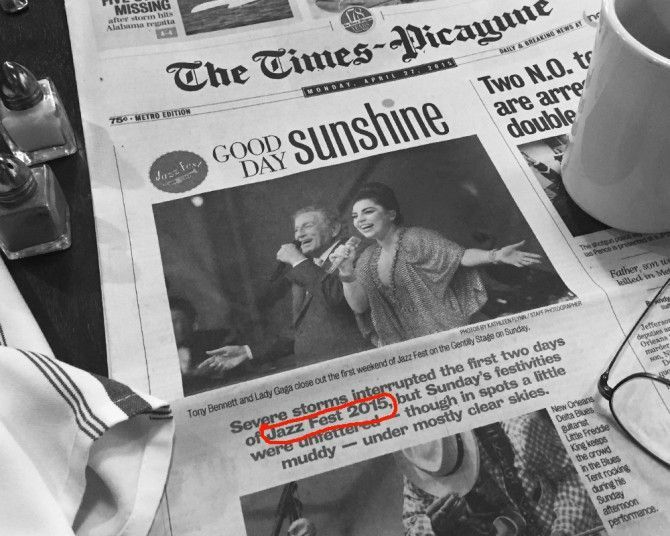 the following day at Jazz fest, I heard someone call my name and was amazed to see Becky the yoga teacher passing by… What are the odds ? After this Milt met me, and surprise surprise, wanted to go clothes shopping – for the second time ! I hear you gasp. First time was yesterday where he enjoyed the full service by Ozzie at Rubensteins, for shirts,shorts and socks; and now for more shorts and shirt at Pelican Coast, truly a fashion icon and ready for a hot steamy Jazzfest. Dinner again with Julie and Dr. Bob, so hospitable and generous with their time for our visit ! 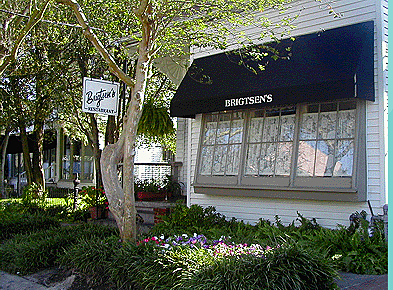 A garden district restaurant, off Magazine. Renowned chef, and as always everyone knew and welcomed Dr. Bob and Julie like family. Another superb food and wine experience. A delicate starter of potato gnocchi would have been very at home at Azark and the home made crab ravioli was amazing. Next day Jazz fest.. 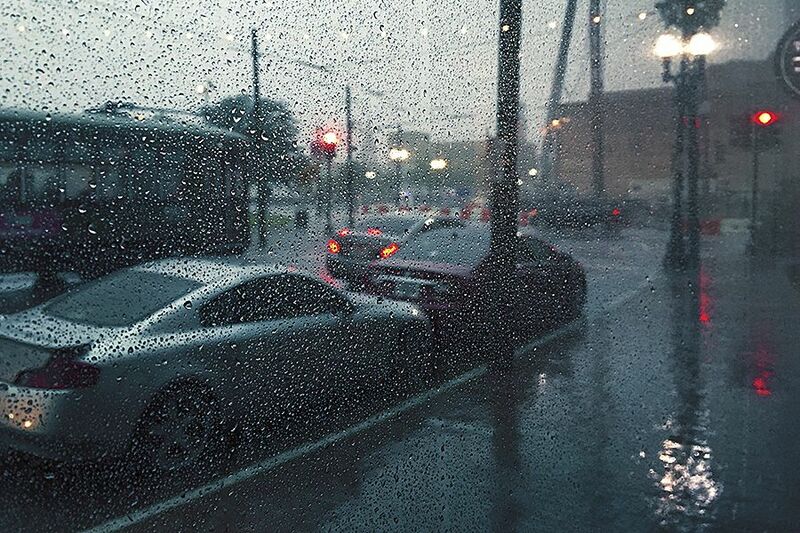 Warning for non music fans skim skim…….easy transport, stroll down St Charles St, hop on Canal st Bus on red cable car line and straight there. Huge queues but we already had our passes and so after relatively short wait were straight through. 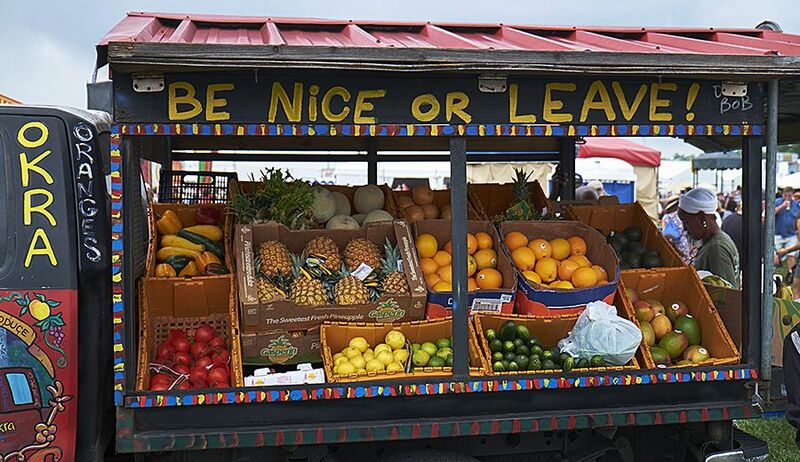 Huge crowds like WOMAD and blues fest x5 – but very friendly …. 2 huge stages at either side of the fairground, then four small outdoor stages in the centre and large tents for jazz, blues, and gospel along one side. Possibly our favourite stage was the small Lagnaippe stage in the mounting ring of the race track. It was where the less known acts were, and was a really delightful hedged and sheltered setting where you were closer to the musicians. The ‘Big Chief’ tickets _ priceless at times. 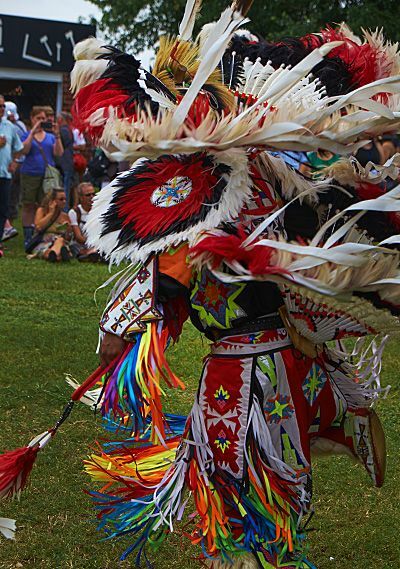 Local American Indian tribes. Fantastic colour and parades. 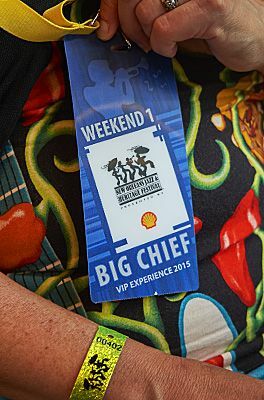 The pricey Big Chief tickets were very worthwhile- why…access to great clean toilets …..reserved seating at the bigger stages and tents and a hospitality area where you could go to relax and refresh. They meant we could really wander from place to place rather than have to miss acts because of having to get somewhere so early to secure a space. 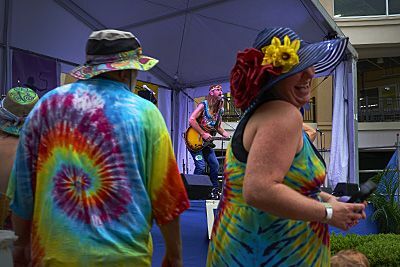 Day 1 Cajun band the Revelers, French Louisiana style a lot of fun….then Mia Borders – really cool, brilliant guitarist and witty stage patter, then Sean Johnson and the Wild lotus band- interesting take on yoga mantras- quite hippy but really beautiful…. In the middle we dropped in on the kids tent to see a school group the encore academy, that we had seen having fun dancing at the Revellers – very cute. In particular a tiny sassy girl who led a stomp dancing group and who’s proud daddy ( very large) stood up at the end shouting “that’s my girl that’s my girl”. Next some blues with Jonathon Boogie Long- another big southern boy and smoking guitarist, before getting our spots for the Tedeschi Trucks Band. Thats us bottom left in then stand. Way cool, first time we had heard Susan Tedeschi and she is an amazing vocalist as well as guitarist- Milt was in heaven. Derek Trucks and Susan Tedeschi . Some of the tie die crew. And a tie die crew assembled for a tie die memorial to a friend ! Kids enjoyed it as well. Clouds really gathering so we made smart decision to pull the pin and head for the bus back home, in the nick of time and glad we had bought those ponchos….got in bus queue amid thunder and lightning to find that the whole fest had been shut down due to the storm. Smooth if somewhat crowded trip home, short rest and then out to a local Columbian restaurant Mais Arepas, to meet Stephen Pomes, a Twitter friend of Whitey’s and his friends Lisa and Helmut. Entertaining evening Stephen and Whitey share political and geological interests not wine, I had a heap in common with Lisa, Stephen’s partner and Helmut was a keen photographer. Fascinating how American’s share their political views so freely, from the signs, flags and pennants people put on their houses and gardens to the way they introduce themselves! 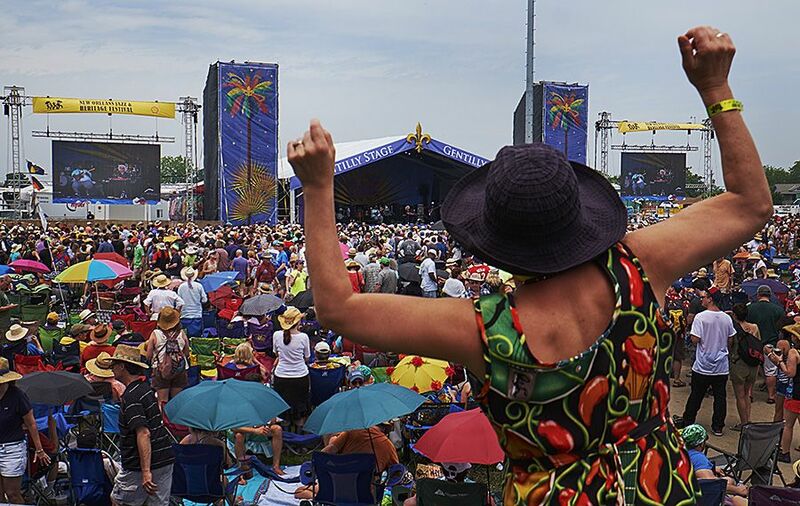 Second day of Jazz fest, began with blues, John Lisi and Delta Funk….very danceable…missed my dancing buddies but of course that didn’t stop me….found some new ones. 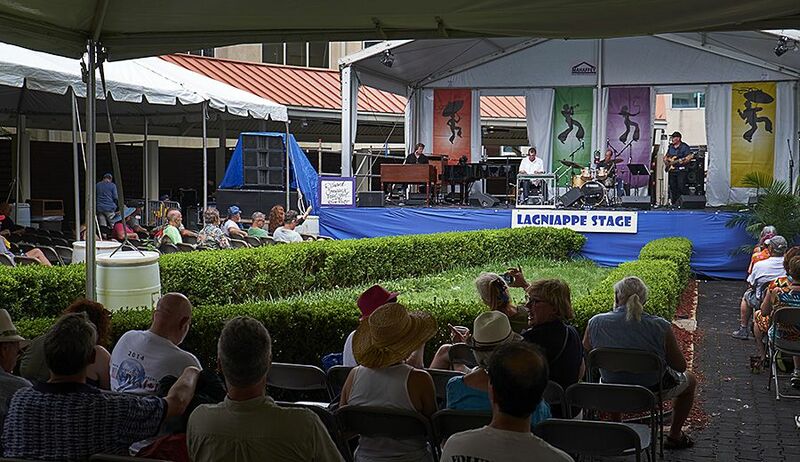 Then headed to Lagniappe for Richard Comeaux pedal steel… Briefly stopped into hospitality tent where the weather channel was signalling a severe storm – not to be put off thought we could make it to Jazz tent for- Milt got a spot, AM picked up some Vietnamese, really refreshing to have cold rolls and beef vermicelli salad. 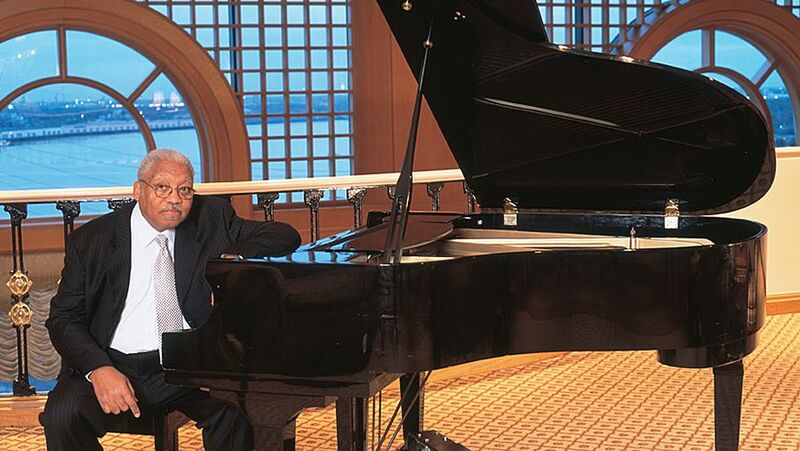 Ellis Marsalis the great patriarch of a jazz family. Got settled in and had a great spot just in time, the deluge hit….people flooded in to all available spaces and had an amazing experience of some of the best jazz piano and brass section that we have had, came close to our Winton Marsalis experience in New York some years back. The line up trying to get into the Jazz Tent during the downpour.Very glad of our ‘Big Chief ‘passes. Storm passed and Milt headed for Blues tent for Vieux Farka Toure and AM diverted to Gospel tent for the last bit of the Revivalists, wishing she was wearing the “Smile there is no hell” t shirt she had seen yesterday – but really enjoyed the voices and vibrancy – Sing out so the devil can’t get you! Much hand clapping ! Seemed the more popular you were the bigger group of photographers in the press cage. Cassandra Williams was very popular. 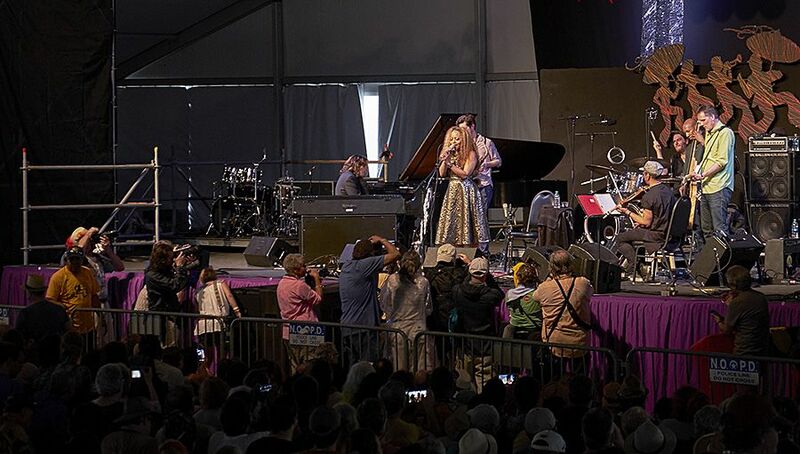 Returned to Jazz fest for Cassandra Wilson – celebrating Billie Holiday…. Amazing voice and arrangements, really tight band, felt more like the American songbook than Billie Holiday and didn’t touch on the gutsier songs such as Strange Fruit, but really enjoyable as the rain kept falling. People started clearing out for the Who and John Legend, we scooted back to the hospitality lounge for quick bathroom and to decide whether to brave the Who, watched a bit on the screen before making the best decision…..Robert Cray Band…… INCREDIBLE … Guitar change at each song…Much grandstand dancing ! 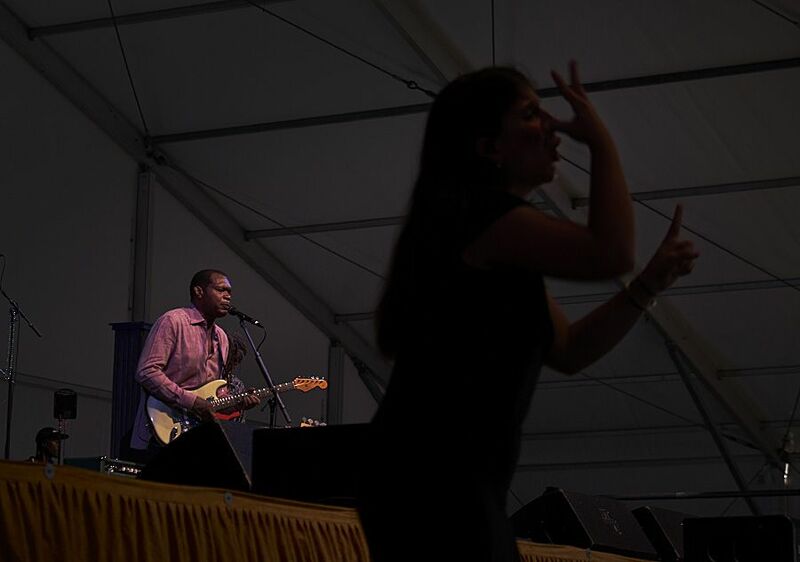 Anne Maries next career move _ A signer for Robert Cray’s blues band !! Weather had completely fined at this time, in no hurry to stand in bus queue so did a slow wander back. Everyone in surrounding streets gets into the spirit, decorating their houses, playing music, and often inviting complete strangers in for parties. 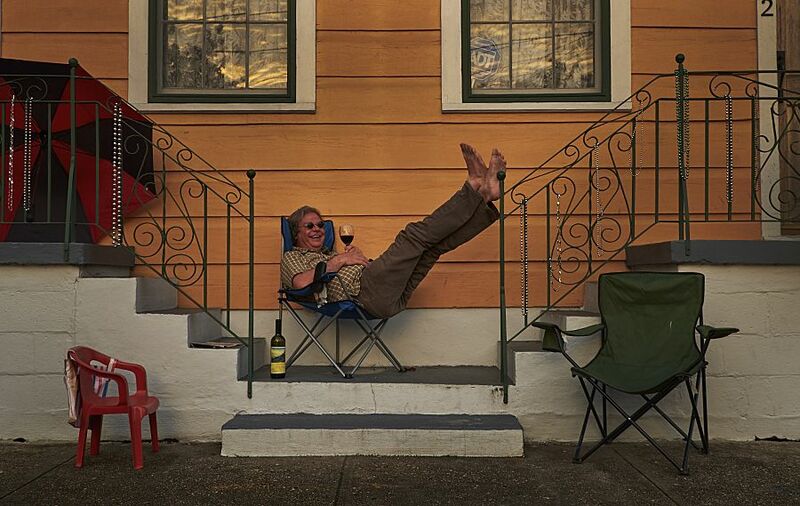 Milt took this photo of Patrick on his stoop enjoying wine NOLA style. Patrick O’Hara on his stoop. A glass of wine new Orleans style ! Wandered back to town, Milt yearning for a simple steak, stopped in at Cibugnu, Italian, great food and good service. The small 22 ounce steak !! 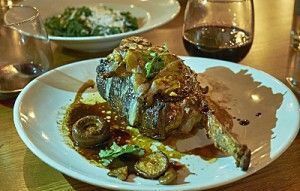 Have you got a small steak- smallest turn out to be 22 ounces…. There are 3 sizes, 22, 36 and 46 ounces, how any one could eat a 46 ounce (thats’ 1.3 kilos) of meat baffles us, but they told us they sell them regularly. Even at 22 ounces it was huge but delicious and well cooked. AM happy with her small rabbit pappardelle was able to help out. 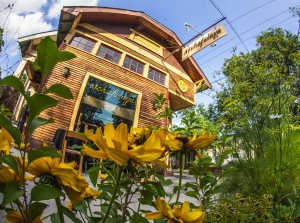 Last day of Jazz fest….began with Bryan Lee, blind blues guitarist….then hopped to Lagniappe for Mikayla, young folk pop singer, uke and keyboard player with great bass player and young drummer. 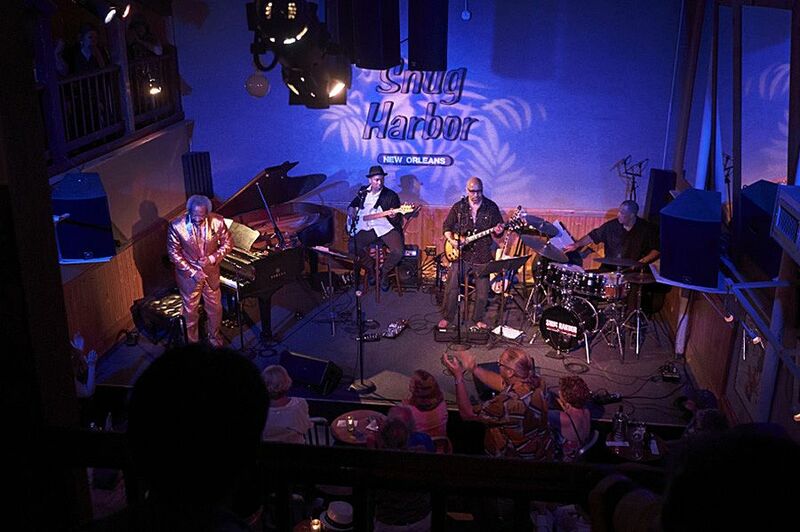 Milt sampled oysters….at oyster bar adjacent to stage…. freshly shucked and very good. Excellent way to start the day. 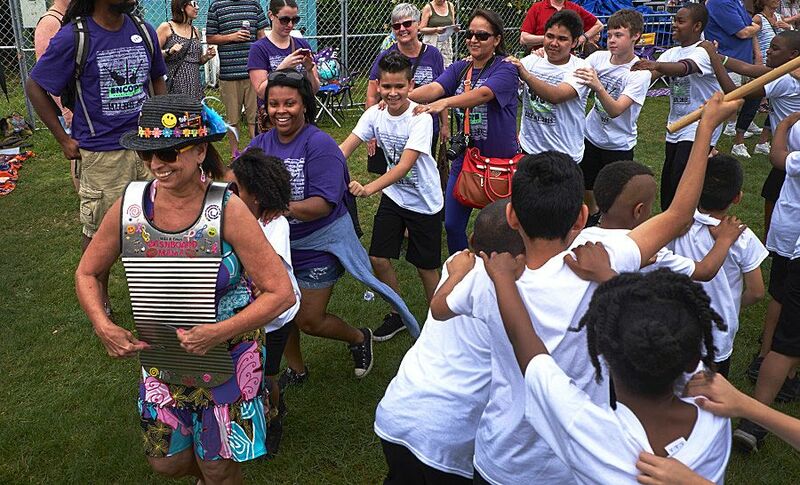 We headed to large Gentilly stage for Jon Cleary, opened with When you get back… Of course more dancing. Excellent set, monster gentlemen even more monster than last time we saw them, Big D the guitarist looks like he has lost the ability to stand- but of course he can still play !! 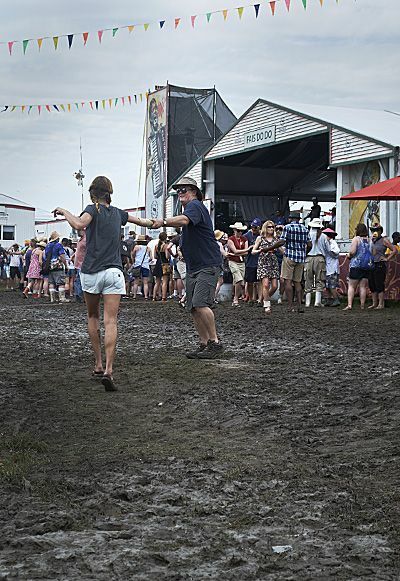 We braved some of the mud to see Savoy Family Cajun band, found small grass patch but kind of wished had had the wellingtons so AM could have joined these happy dancers. Grabbed some Southern fried chicken and spinach and artichoke gratin and caught the last set of New Orleans Jazz Orchestra before the great Allen Toussaint. Anne Marie gets into it with Jon Cleary. Such a great show ! Full band rhythm and brass section and back up singers, played all the favourites and then some. Amazing sparkling green suit…. Crowds also really massing for Tony Bennett and Lady Gaga, even reserved seating area full to the brim, so we decided not to give up our spots and were not disappointed. Tony Bennett at 88 was in finer voice that Roger Daltrey at 70+ . He and Lady Gaga had good chemistry and we were surprised at how attune Lady Gaga was to the classics. she had as many wardrobe changes as Robert Cray had guitar changes- very entertaining ! 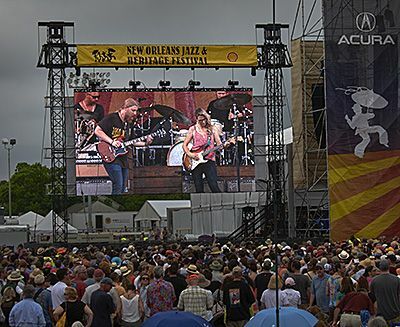 We bid farewell to Jazz fest to get back to town ready for Allen Toussaint’s evening show at Snug Harbour that Dr Bob and Julie had set up for us. Truly memorable, smaller band, tiny intimate venue, his repertoire is amazing, he did some great improvisation with snippets of many classical and songbook motifs in the most surprising and wonderful ways. band was extremely tight – an amazing way to say goodbye to New Orleans musically. 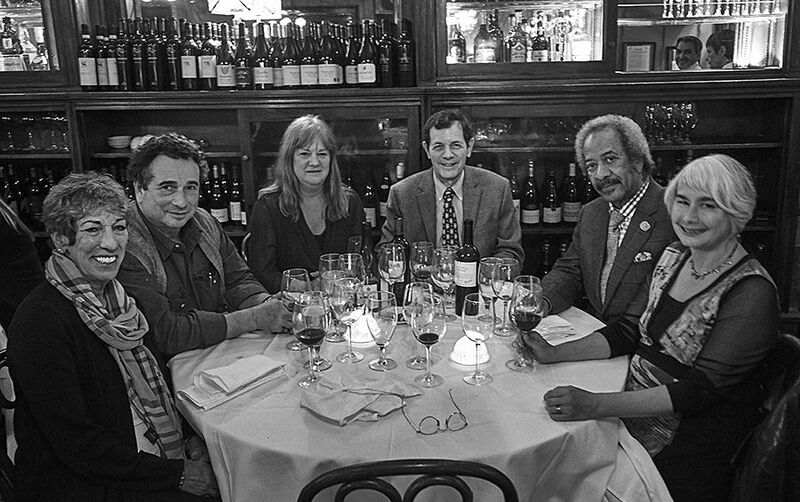 Finished our stay in New Orleans with dinner at ‘Gautreaus’ restaurant with Dr Bob, Julie, Allan Toussaint, and his friends Josh from New York and Harriet from LA. Gautreaus is where Milt shot Dr Bob’s Grange dinner for the book. Dr Bob took care of the wines. Bit like going out with Peter Gago – Criots-Batard-Montrachet: Domaine Fontaine-Gagnard, Chateau Latour 2003 and St Henri 2009. Superb dinner – beautifully dressed salad, Flounder and Buttermilk Pannacotta; Milt had the Creme Brûlée with a bourbon – as suggested. Dr. Bob took me on an excursion to the kitchen to see the team in action – what a privilege…… as it was to have some time with Allen Toussaint, such a gracious gentleman, a real New Orleans icon. Off today to LaFayette and Austin.